Talking about tourism in Bali will never end. 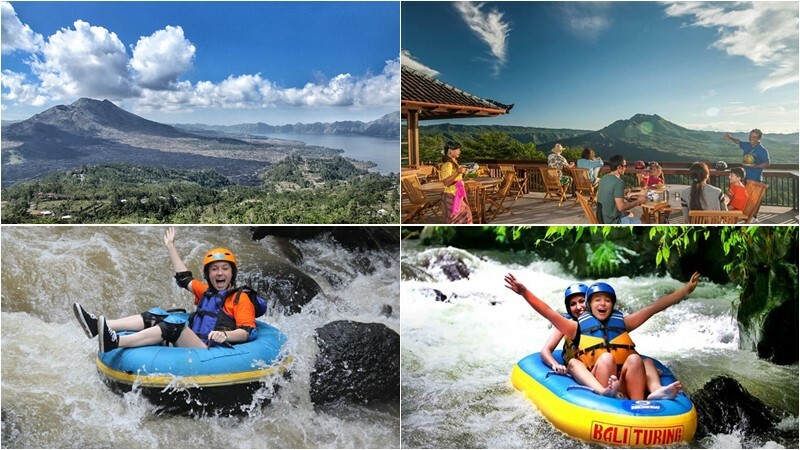 Tourist attractions in Bali, in addition to showing natural beauty on land, culture, art but also underwater beauty. 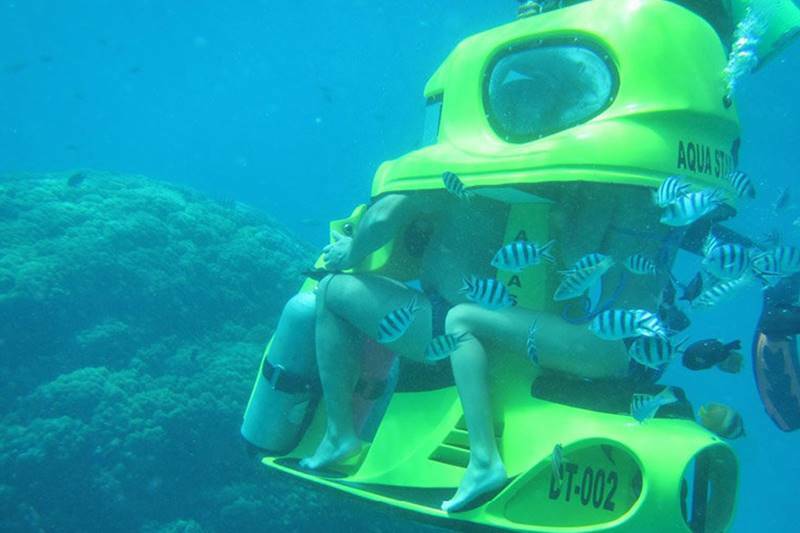 Famous and also popular scuba diving and snorkeling spots are quite widely available. And the location spreads throughout the island of the Gods. Some of them are favorite locations for tourists both domestic and foreign tourists. Interestingly, some spots can be used by beginners without the need to have a diving certificate, because it functions as a diving spot for amateur visitors or non-swimmers. You are certainly curious, right? Here’s the review for you. This beach is not a dream location for professional divers. But it is known as a place for water sports. The location was developed as part of entertainment for tourists complete with facilities provided by watersport providers. 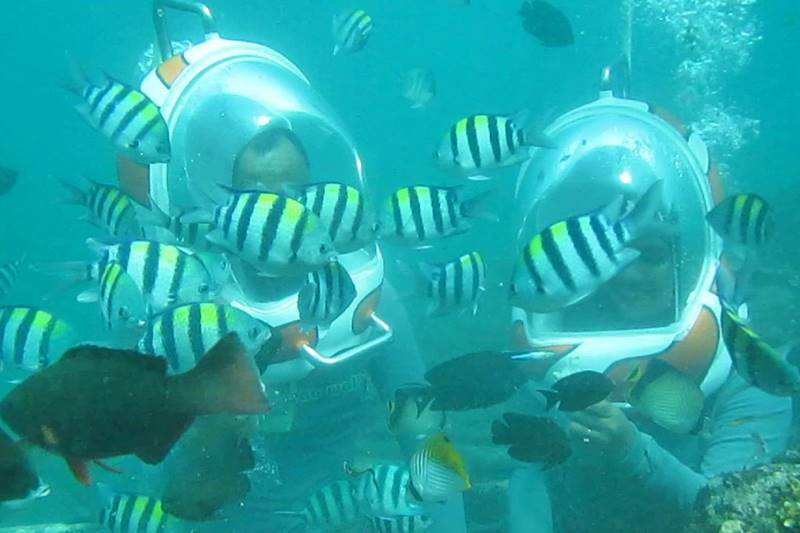 You can enjoy the beauty of the underwater at Tanjung Benoa by doing Ocean Walker or sea walker. You don’t need to bother carrying oxygen cylinders or breathing from your mouth. This activity is quite easy for everyone to do, just wear a “glass helmet” and you breathe as usual on land. After wearing the necessary equipment, you will descend at a depth of 7 meters to see the beauty of the marine, coral and coral reefs accompanied by professional divers. In addition, around this beach there are also many coral reefs that you can explore with snorkeling. Tanjung Benoa can be a top choice, if you don’t just want to do Ocean walker activities, but rather a combination with other Bali watersport options such as flying fish, parasailing, jetski, etc. In addition, Tanjung Benoa can be reached in a relatively short time, which is around 20-30 minutes by car from Kuta. This dive spot in the Sanur beach area of Bali is also aimed at watersport tourist attractions like Tanjung Benoa. The dive site here is called “SeaWalker Sanur” but not as busy as Tanjung Benoa. This is due to the fact that the place for water sports in Sanur is not as complete as in the South of Bali. Exploring the underwater world of Sanur beach to a depth of up to 8 meters will be a new experience for those of you who have never participated in Seawalker activities. Because here you can take a walk on the sea floor, instead of swimming, surrounded by various exotic fish species and the diversity of underwater life. To enjoy this tour, you are not required to be able to swim because you only have to wear a helmet that is specially designed and flowed with pure oxygen. This glass helmet is oxygenated and connected to the hose from the Seawalker pontoon. 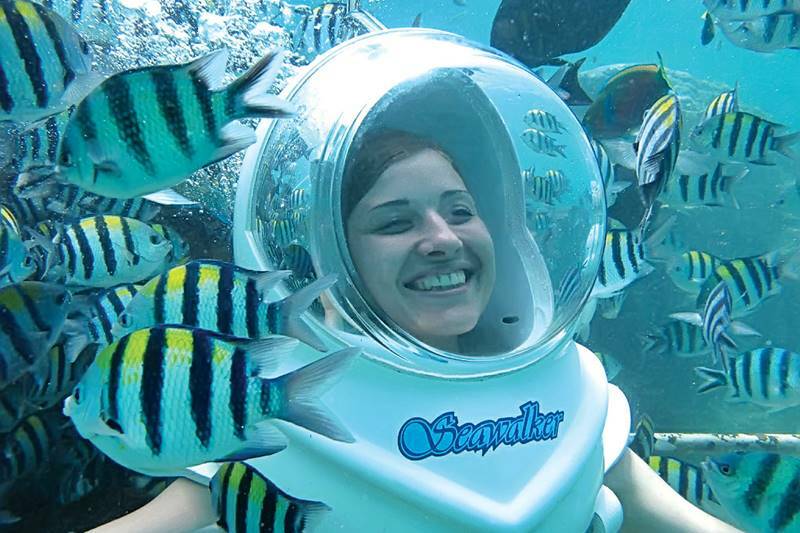 Oxygen continues to flow into the SeaWalker helmet when you are under the sea and you breathe like on land. Even if you wear glasses, you can still enjoy this game, even if your hair isn’t wet. When all the participants go down to the sea, the adventure of walking on the seabed with Seawalker starts immediately. You will enjoy how beautiful this world of God’s creation is. Our instructors will always accompany you during this activity. Stay calm and feel your closeness to natural life for about 30 minutes of diving. In addition to two seawalker activities in Tanjung Benoa and Sanur, Underwater Scooter water sport are now available for tourists who cannot dive or swim. 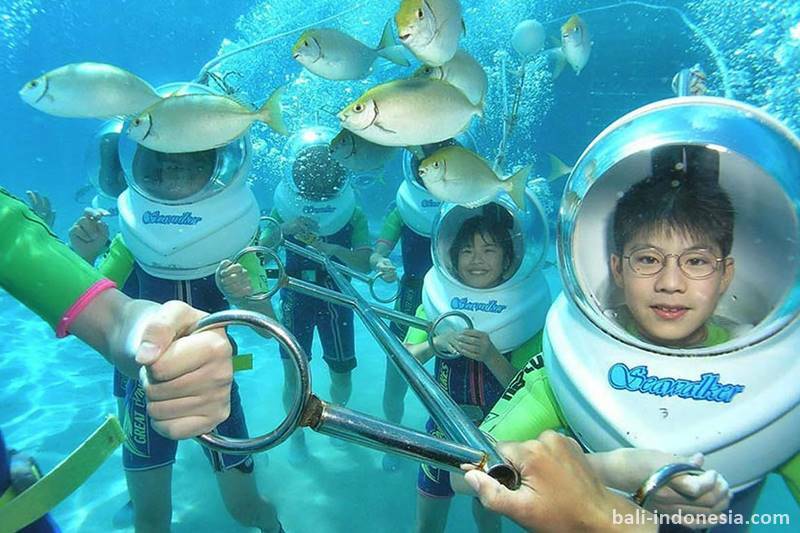 Located on Serangan Island, this activity can provide the sensation of driving with a scooter under the sea. You will feel how to take a ride driving a scooter under the sea. Of course this will provide a unique and new experience when traveling with your partner or family. Underwater Scooter on Serangan Beach will be an option that does not require special skills, because during this activity, you take a special underwater vehicle. The scooter vehicle has also included an oxygen tube that will be used by participants for breathing, in contrast to the Seawalker which is connected to an oxygen hose in the pontoon. Don’t hesitate to take part in Seawalker or similar activities, because you will be guided by experienced instructors and international standard equipment, safety is the first concern in all activities, which of course is also protected by insurance. So, especially for those of you who are non-swimmer and vacation in Bali, you need to consider Seawalker or Underwater Scooter as your watersport activities. Then, if you need Bali experience driver for your trip or activities, please visit https://balicabdriver.com or contact us via WhatsApp +62 878 6196 8073.